Andrew Wilson, chief executive officer of Electronic Arts Inc. (EA), speaks during the company’s EA Play event ahead of the E3 Electronic Entertainment Expo in Los Angeles, California, U.S., on Saturday, June 10, 2017. 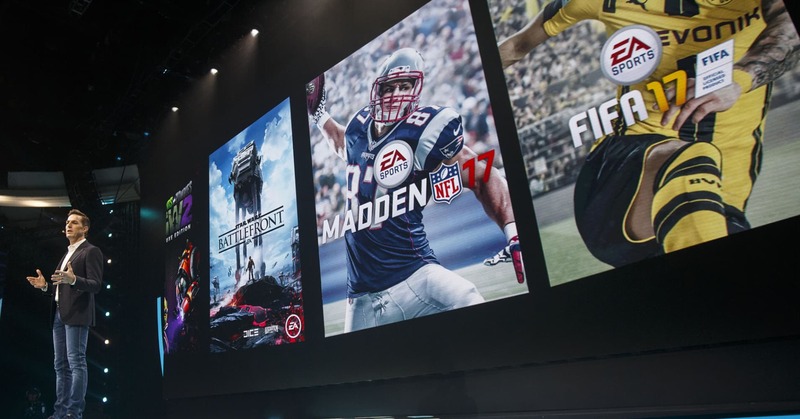 EA fell more than 14 percent after hours after reporting its third-quarter 2019 earnings. The company reported a revenue miss of $1.61 billion vs. estimate of $1.75 billion, according to Refinitiv. Earnings were $1.95 per share ex-items compared with the analyst estimate of $1.94 per share, per Refinitiv. Even during a quarter in which the company released “Battlefield V,” CEO Andrew Wilson acknowledged that EA did not perform as he had hoped, in a statement in the company’s release. In a statement, COO and CFO Blake Jorgensen said “FIFA” has remained “a robust franchise.” “Elsewhere in the business, we’re making adjustments to improve execution and we’re refocusing R&D,” he said. Here’s the share of income that goes to rent in cities across the U.S.